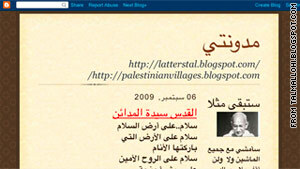 Tal al-Mallouhi's blog contains poetry and social commentary on local and Arab affairs. State Department says charges of espionage against al-Mallouhi are "spurious"
(CNN) -- The United States on Saturday called for the immediate release of a young blogger imprisoned in Syria on espionage charges. "The United States strongly condemns Syria's secret trial of blogger Tal al-Mallouhi, calls for her immediate release, and rejects as baseless allegations of American connections that have resulted in a spurious accusation of espionage," State Department spokesman P.J. Crowley said in a statement. "We call on the Syrian government to immediately release all its prisoners of conscience; and allow its citizens freedom to exercise their universal rights of expression and association without fear of retribution from their own government," he added. Syrian Intelligence Services summoned al-Mallouhi, then 18 and a high school student, in December 2009 to question her about her blog, which contains poetry and social commentary on local and Arab affairs, the Syrian Human Rights Committee has reported. Her computer and other personal belongings were taken from her parents' home in Homs, according to the the New York-based Human Rights Watch. Family members told the rights group that al-Mallouhi belonged to no political organizations. Numerous groups have called for her release, and al-Mallouhi's supporters have created Facebook pages in Arabic and English demanding she be freed. The government's stranglehold over mainstream media in Syria has prompted young people to take to the blogosphere over sensitive social and political issues, according to the Institute for War & Peace Reporting. Many bloggers there use pseudonyms for fear of being jailed, and readership remains minimal as internet penetration in Syria is still low.